Click here for candidate statements in the June issue. My nomination as candidate for president of the World Federation of Neurology has been endorsed by the American Academy of Neurology and the Neurological Association of Colombia. re Hospital in Paris, France, and at the University of Vermont. These early experiences gave me a good background in global neurology. Fluency in Spanish, French and English — languages spoken by 2 billion collectively — has allowed me to communicate with many people and provided me with an appreciation for the cultural richness of their nations. Moreover, the practice of clinical neurology in academic centers in Colombia and in the U.S., in addition to international research collaboration in many parts of the world as director of neuroepidemiology at the National Institutes of Health (NIH), allowed me to develop a deeper understanding of the problems confronted by neurologists in many parts of the world. 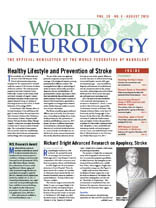 I have been involved with the World Federation of Neurology (WFN) for more than 20 years, particularly with the education and research groups in neuroepidemiology, dementia and tropical neurology. I recently created the Environmental Neurology Research Group (ENRG). For more than 15 years, I have been a member of the editorial board of The Journal of the Neurological Sciences, the official publication of the WFN. In 2008, I began my three-year service as an elected trustee to the WFN Board of Directors under the current administration. I was re-elected in 2011 for a second consecutive term; thus, I have participated in all major policy and administrative decisions of the WFN for the past five years. Throughout my career, I have been interested in numerous research topics ranging from tropical neurology, in particular nutritional problems in neurology, meningitis, herpes encephalitis, neurocysticercosis and tropical spastic paraparesis due to HTLV-1; to the neuroepidemiology of dementia and Parkinson’s disease, stroke and vascular dementia; to recent studies of two modern epidemics: Alzheimer’s disease and autism. I am currently the scientific director and administrator of a large clinical and research Alzheimer’s and Dementia Center in Houston, Texas, and have been successful in fundraising. I hold an academic position as professor of neurology at Weill Cornell Medical College with involvement in the neurological education of medical students, residents and fellows, including an active observership international program. My presidential agenda can be summarized in the motto “Neurology for the 21st Century,” emphasizing the need for widespread and novel use of communication technologies such as cellular telephones and web-based social media as a forum for collaboration, education, training and service including long-distance consultations (telemedicine); encouraging the provision of imaging and clinical neurophysiology equipment in places where neurologists are still deprived of these critical elements for the modern practice of neurology; supporting the translation and dissemination of educational and informational materials of the WFN from English into other languages as a way to improve communication among the member societies, trainees and fellow neurologists throughout the world. I would seek sponsorship and multinational cooperation for neuroepidemiological studies: By facilitating the sharing of international databases, the WFN could allow researchers to analyze the public health implications of the main neurological problems in different parts of the world. I intend to reinforce the African Initiative launched by Johan A. Aarli, as well as Vladimir Hachinski’s Latin American Initiative and Asia-Oceania Initiative. I will continue to enhance the WFN collaboration with the World Health Organization (WHO) and with other international neuroscience societies, particularly with neurosurgery specialists. Early in life, I learned that education is critical in order to overcome the limitations imposed by environment and economic restrictions. I believe that community education is also the answer to many of the neurological problems resulting from treatable risk factors such as hypertension, malnutrition, trauma and violence, among others. Therefore, public health practice and policy should become important tools for neurologists. Increasing the number and educational level of neurologists worldwide by means of modern communication technologies must result in tangible benefits for the neurological health and care of all countries and their peoples. This presidential agenda would continue the legacy of my illustrious predecessors and enhance the name of the WFN in areas of the world where neurology is still a young specialty. For a complete curriculum vitae, please visit www.profgustavoroman.com.